Since 1996 Jane Dixon has been working on related sequences of drawings/works on paper which explore objects designed to contain and protect the body. These objects become equivalents for the absent human forms. Drawings of various medical machines - for breathing, bathing or making x-rays - were succeeded by a series which represent armour and chain-mail. There is an evident interest in pattern in the way the structures of these pieces are represented as repetitive rhythmic links or articulated tessellation. This drawing sets up a series of subtly nuanced oppositions: the armour itself - hard, defensive, designed to repel, and a stand-in for the muscular aggressive male body - is described in a sequence of curvaceous forms, the loops and links themselves suggesting flexibility and permeability. The forms are often ambiguous. Lacking any indication of scale the pieces in 'Untitled [Gauntlets]' resemble the remnants and ruins of some mysterious architecture. The drawings also have analogies with plans, diagrams and architectural drawings. Dixon's drawings are based on armour she has seen and studied in museums, including the V&A. From this starting point they explore the question of context as a means of identifying and understanding an object, and the ways in which display - and particularly museum display - may help or hinder this process, or produce new meanings. 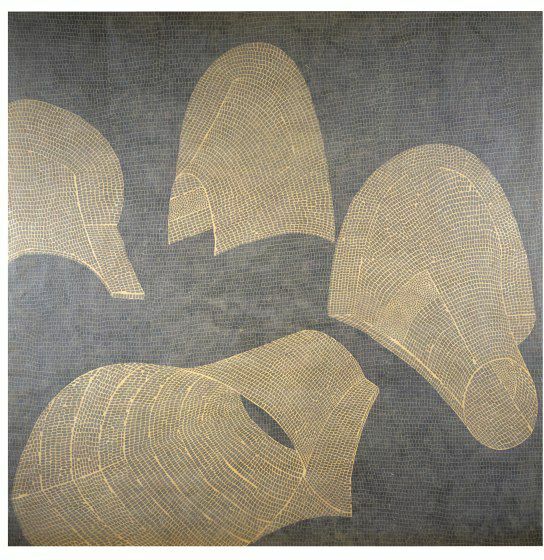 Three layers of paper treated with oil and varnish to create a semi-transparent drawing of pieces of armour (gauntlets). 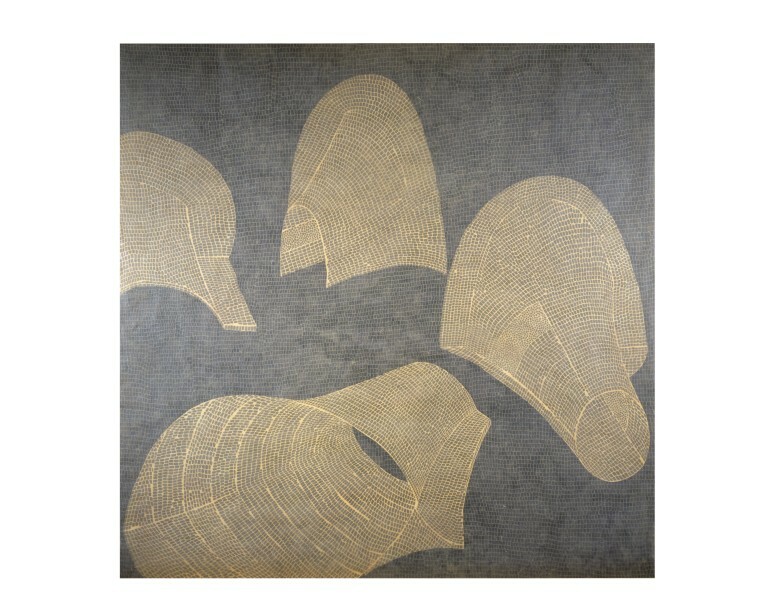 Untitled [Gauntlets], 2000, drawing by Jane Dixon.